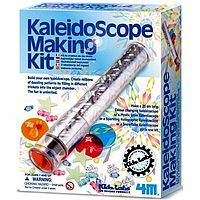 Make a 25cm long kaleidoscope in which the object chamber is specially designed with a removable cover. Simply change the different trinkets included and make a color changing kaleidoscope, a mystic glow kaleidoscope, a sparkling holographic kaleidoscope, or a snowflake kaleidoscope. You could also put in your favorite trinkets to create your very own style of kaleidoscope. Lots of ideas included and the fun is unlimited.